What you need to know about academic regulations that apply to all MSM students. All students have an obligation to behave honorably and to respect the highest ethical standards in carrying out their academic assignments. Academic dishonesty is defined to include any form of cheating and/or plagiarism. In cases involving academic dishonesty or falsification of academic information, a failing grade, disciplinary sanctions, probation, or dismissal may be administered. A referral will be made to the Vice President for Academics & Performance who shall then bring the case to the Dean’s Council. The Council may elect to conduct a hearing in the case, mediate the case between the complainant and the student(s) referred, or to establish a hearing panel of three faculty members to render an opinion. In any case, the decision of the Dean’s Council will be final. Students are urged to read about the Standards of Personal and Group Conduct and the Campus Judicial System in the Student Handbook. Probation: In reviewing student records, the Committee on Academic Progress may place a student on probation. Reasons for probation include: failure to meet the year level requirement set by any department; repeated withdrawals, incompletes, and/or failing grades; a consistent pattern of low grades, including a low or failing Jury Examination grade or failure to progress sufficiently through the English as a Second Language Program. Students placed on probation become ineligible for scholarship assistance, and if their overall cumulative grade point average falls below 2.0, they become ineligible for any type of federal or state financial assistance. At the conclusion of each semester, the records of all students on probation will be reviewed again by the Committee on Academic Progress. If satisfactory progress has not been made, the Committee may take further action, which could include a forced leave of absence or dismissal. Dismissal: Grounds for dismissal include unsatisfactory academic and/or musical progress, any form of cheating and/or plagiarism or falsification of academic information, or violation of the student Code of Conduct. Students dismissed at the conclusion of either semester are ineligible to attend the School during the following 2 semesters. Information regarding reapplication to the School and auditions are available from the Office of Admissions and Financial Aid. The School retains the right to cancel the registration of any student whose continued attendance is considered detrimental to the interest of his or her fellow students or of the School. Any student who misses lessons, classes, and rehearsals for more than twenty percent of the meetings for reasons that the teacher considers insufficient, will be sent to the Dean of Students for permission to continue in the class. Students with excessive or unexcused absences from lessons, classes or rehearsals may receive a withdrawal or a failing grade, or, in extreme cases, will be subject to probation or dismissal. Any student who has two consecutive unexcused absences in his or her private lessons must see the Dean of Students before lessons may resume. Students who exhibit a pattern of absences will be required to see the Dean of Students. Manhattan School of Music is sensitive to the needs of students who wish to observe religious holidays during the academic year. To accommodate the planning needs of studio teachers, classroom teachers, and ensemble directors as well as to fulfill the educational and artistic requirements of the semester’s work, students who anticipate being absent for religious holidays need to inform in writing their teachers and ensemble directors during the first week of classes at the beginning of each semester of the exact date/dates that the student will be absent. The student should also give a copy of the request to the Dean of Academics. If students follow the preceding policy and understand that they are responsible for classroom work and ensemble obligations missed, absence for religious holidays will be excused. Students who do not inform their teachers in writing with a copy sent to the Dean of Academics during the first week of classes will not be excused. Final examinations are held during the 15th week of each semester. Students who fail to take a required class examination may be given an incomplete by the teacher if all other work for the course has been satisfactory. All Incomplete grades must be preapproved by the Vice President for Academics & Performance. Incomplete grades will be converted to failing grades by the Registrar if the final grade is not received by the end of the following semester in which the incomplete grade was given. Students who are taking large group examinations in the Music History and Theory Departments will be required to show proof of identity (i.e., a picture ID) before being allowed to enter the examination room. Advanced Standing examinations are for the purpose of advancing a student’s performance status. Advanced standing can only be granted for one semester. Petitions for Advanced Standing must be approved by the major teacher and the department chair before being submitted to the Registrar for final approval. Advanced standing juries may be taken only once, and the results of the jury are final. Graduate students are not eligible for advanced standing. Students in their first year of attendance are not permitted to take Advanced Standing examinations. A student has the right to petition the administration regarding any topic that is not covered in the current school catalog, yet pertains to study at the School. Forms are available in the Office of the Registrar, the Office of the Vice President for Academics & Performance, the Office of the Dean of Students or can be downloaded and printed by clicking here. 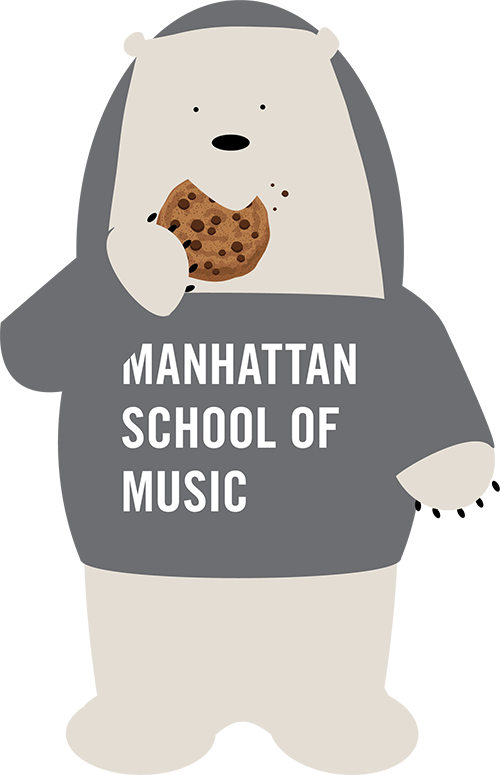 It is the policy of Manhattan School of Music to screen all requests for information concerning students. Students who wish to restrict the release of such information are required to notify the Office of the Registrar in writing. In accordance with the Family Educational Rights and Privacy Act of 1974 (Buckley Amendment), students enrolled at Manhattan School of Music have the right to see educational records maintained by the School which are related to them. The Office of the Registrar retains the original copy of each student’s academic record. Official transcripts, carrying the School’s seal and an official signature, are issued only upon the written request of the student. Transcripts are not issued while a student is in arrears or in default on student loans or if there are any outstanding fees or charges from any School office. Get details about ordering transcripts and letters of certification here. Additional credits include transfer credits and the results of Advanced Standing examinations, placement examinations and qualifying examinations. Transfer credits from other nationally accredited institutions may be accepted into a degree or diploma program through evaluation of official documents by the Office of the Registrar. Transcripts of such course must show a grade of C or above. Students who have attended universities overseas where English is the language of instruction may petition to have humanities courses considered for transfer credit. This petition will be reviewed by the Chair of the Humanities Department. Transfer credit is not given for courses from institutions where the language of instruction is other than English. Manhattan School of Music does not accept AP credits, nor credits earned in online courses for transfer. Students may also earn additional credits through their audition, an Advanced Standing examination in their junior or senior year, Placement exams at their entrance into the school and through qualifying exams scheduled at the beginning of each semester. A maximum of sixty (60) additional credits may be applied towards an undergraduate degree or diploma. A maximum of six (6) graduate non-performance credits may be transferred to a master’s degree. No transfer credit will be granted for credits used towards another degree or for major lessons and ensembles. The right to inspect and review the student’s education records within 45 days after the day the School receives a request for access. A student should submit to the registrar, dean, head of the academic department, or other appropriate official, a written request that identifies the record(s) the student wishes to inspect. The school official will make arrangements for access and notify the student of the time and place where the records may be inspected. If the records are not maintained by the school official to whom the request was submitted, that official shall advise the student of the correct official to whom the request should be addressed. The right to request the amendment of the student’s education records that the student believes is inaccurate, misleading, or otherwise in violation of the student’s privacy rights under FERPA. A student who wishes to ask the school to amend a record should write the school official responsible for the record, clearly identify the part of the record the student wants changed, and specify why it should be changed. If the school decides not to amend the record as requested, the school will notify the student in writing of the decision and the student’s right to a hearing regarding the request for amendment. Additional information regarding the hearing procedures will be provided to the student when notified of the right to a hearing. The right to provide written consent before the university discloses personally identifiable information (PII) from the student’s education records, except to the extent that FERPA authorizes disclosure without consent. The school discloses education records without a student’s prior written consent under the FERPA exception for disclosure to school officials with legitimate educational interests. A school official is a person employed by the School in an administrative, supervisory, academic, research, or support staff position (including law enforcement unit personnel and health staff); a person serving on the board of trustees; or a student serving on an official committee, such as a disciplinary or grievance committee. A school official also may include a volunteer or contractor outside of the School who performs an institutional service of function for which the school would otherwise use its own employees and who is under the direct control of the school with respect to the use and maintenance of PII from education records, such as an attorney, auditor, or collection agent or a student volunteering to assist another school official in performing his or her tasks. A school official has a legitimate educational interest if the official needs to review an education record in order to fulfill his or her professional responsibilities for the School. Schools may disclose, without consent, directory information including a student’s name, telephone numbers (permanent, primary, and cellular), addresses (including electronic mail), date and place of birth, major, honors, awards, photograph, classification, dates of enrollment, enrollment status, degrees conferred, dates of conferral, graduation, distinctions, and the institution attended immediately prior to admission. Students who wish to restrict the release of such information are required to notify the Office of the Registrar in writing within 10 days of the first day of the semester of enrollment. A request to withhold information may be submitted after the stated deadline, but information may be released between the deadline and receipt of the request. and the institution attended immediately prior to admission. Directory Information may be made available to the general public unless you request that the School withhold disclosure of such Directory Information. In order to exercise your right to withhold Directory Information, you must notify the Office of the Registrar, in writing, no later than 10 days after the first day of the semester of enrollment. A request to withhold information may be submitted after the stated deadline, but information may be released between the deadline and receipt of the request. You may request a copy of Student Authorization to Withhold Directory Information Form from the Office of the Registrar. Once you have requested the School to withhold Directory Information, that request will be valid until you rescind the request in writing on the original Authorization to Withhold Directory Information Form. Has determined that the student is legally a dependent of the parent/guardian according to the Internal Revenue Code of 1986, Section 152. The School will use information in copies of current tax returns provided to the School to aid in determining dependency. These forms may have been provided previously in support of the student’s financial aid application. Parents may also send a statement in writing certifying that the student is a dependent with a copy of a current income tax form attached. For further information on FERPA, please contact the Office of the Registrar or Director of Administration & Human Relations. To other school officials, including teachers, within the School whom the school has determined to have legitimate educational interests. This includes contractors, consultants, volunteers, or other parties to whom the school has outsourced institutional services or functions. At other times as the School’s administration deems appropriate within FERPA guidelines.